The reproduction fee reflects the labor and materials cost of creating a copy of the photo or image. This one-time fee will vary according to the size and type of copy created, and may also include extra charges for rush orders or additional staff research. The use fee is charged for permission to use the copy of the Museum’s original image one time, whether for personal or commercial purposes. Each subsequent use (for instance, a re-broadcast or new publication) will entail another use fee and agreement. For both kinds of fees, we distinguish between personal and non-profit use, such as display in your home or in a scholarly journal, and commercial use, such as display on commercial premises or publication as part of an article or advertisement. Determination of which fees apply in any given instance is at the discretion of Museum staff. All fees are in U.S. dollars and are charged per image, for a single use. 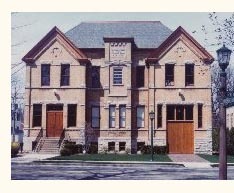 Possession of a reproduced image from the Wilmette Historical Museum does not constitute permission to use it. Permission for use of images is governed by the WHM Photo Order and Use Agreement, which must be signed by the user as part of any photo or image order. Note: the Museum does not supply digital reproductions of its images except directly to printers, publishers, or webmasters for commercial use. All fees must be paid in advance before an order can be processed. These totals represent the reproduction fee + $10 use fee per image. These totals represent the reproduction fee + $30 use fee per image. Re-use fee for subsequent publication is 50% of use fee, or $15 per image. All fees must be paid in advance before an order can be processed. Orders will be ready for pickup in two to three weeks. Click here for the Photo Agreement form.